Glasgow is a city of stories. People have been living at this place along the River Clyde in southwestern Scotland since prehistoric times. Saint Kentigern came to share the Christian faith more than fifteen centuries ago. It has been a center of shipbuilding, of trade in many sorts of goods, of travel. It has been a European City of Culture and a UNESCO City of Music. Contemporary Glasgow is a many faceted city, whose day to day life is enriched by layers of history. One way to consider these facets is through its art, especially through its statues. There are hundreds across the city. To begin to catch the essence of Glasgow, though, consider these six statues. 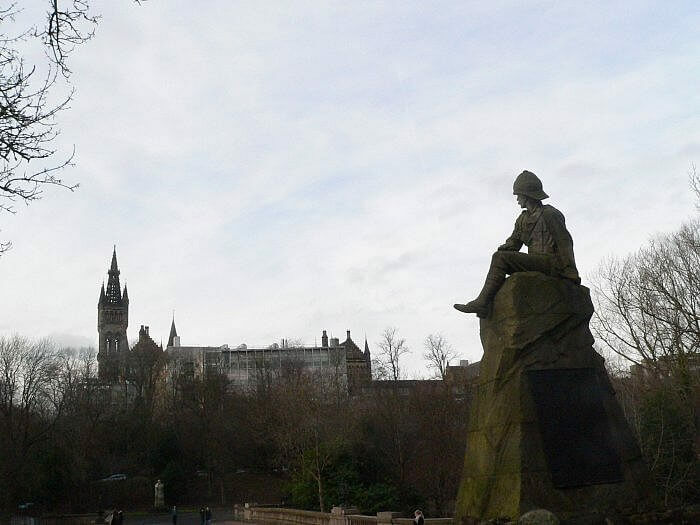 Glasgow is a city of learning, both formal and informal, the home of the University of Glasgow, Strathclyde University, The Royal Conservatoire of Scotland, and Kelvingrove Art Gallery and Museum, to mention just a few of the places of learning on the city. William Thompson, Lord Kelvin, was a mathematician and physicist. 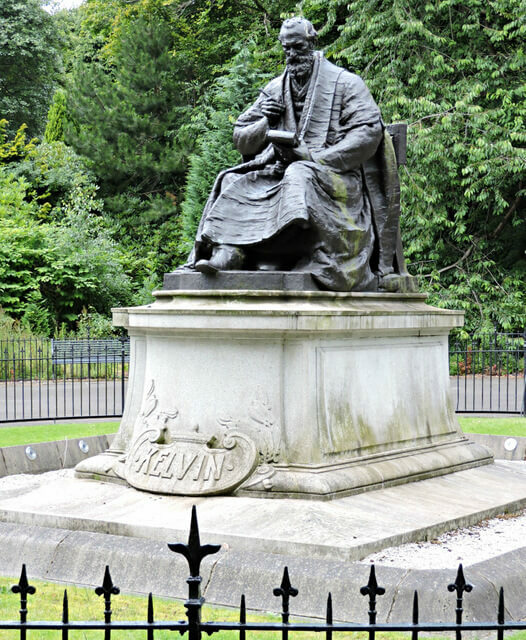 He had a long career in teaching and research at the University of Glasgow, which is just up the hill from where his statue sits. Part of his research had to do with temperature; the Kelvin units are named for him. His work on increasing the reliability of the mariner’s compass is credited with saving many lives at sea. Like much of Scotland, Glasgow has sent many of its sons and daughters off to serve their country in lands far away. Military statues can seem a bit pompous and distant. This one, which remembers those of the Highland Light Infantry who fought and died in the Boer War in South Africa, shows the human aspect of such service well, though. 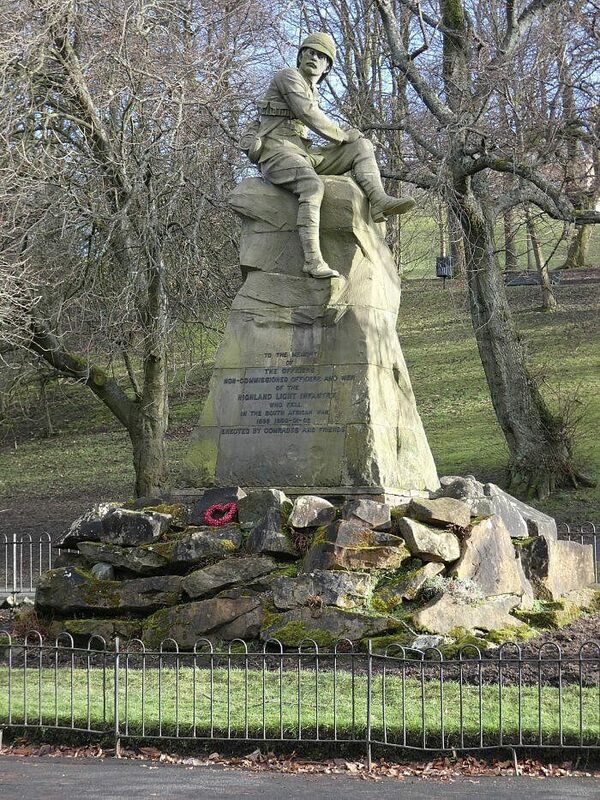 It is in Kelvingrove Park near the River Kelvin. –> Update: In recent days (late 12 February evening 2019) the statue of the soldier was attacked with a hammer and damaged. The photograph shows the statue before this attack. High up above the west end of busy Sauchiehall Street, this angel displays angelic talents by playing two flutes — or pan pipes– at once. 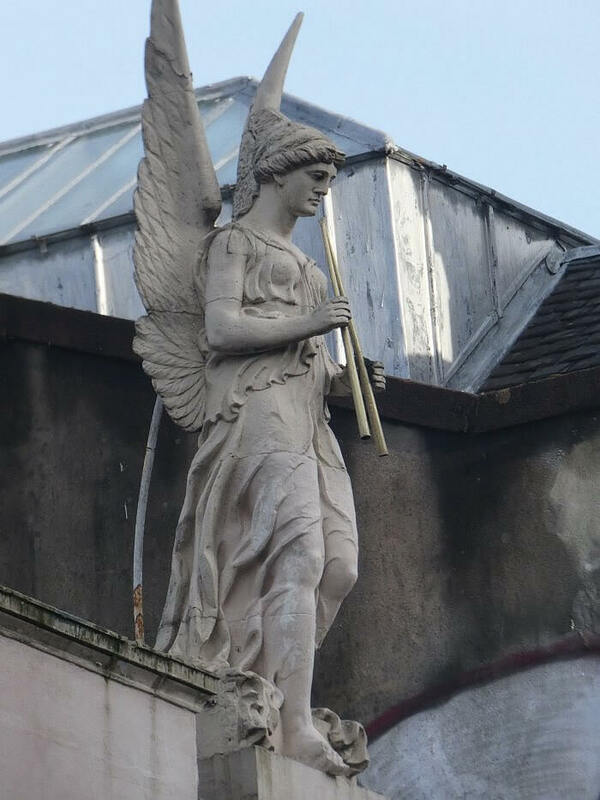 The building over which the angel plays has been through changing uses. When the statue was created in the 1890s, however, it was the music store owned by Thomas Alfred Ewing, who just happened to know a talented sculptor, his brother, James Alexander Ewing. They called the statue Harmony, though now it is known mostly as the angel. That Glasgow is a city of music, and of faith are two things to be learned from the angel. There’s a third lesson: as you walk the streets of Glasgow, look up. You will often find interesting art work there. You will find art closer to ground level, as well. Glasgow is not without its problems, of which homelessness is one. 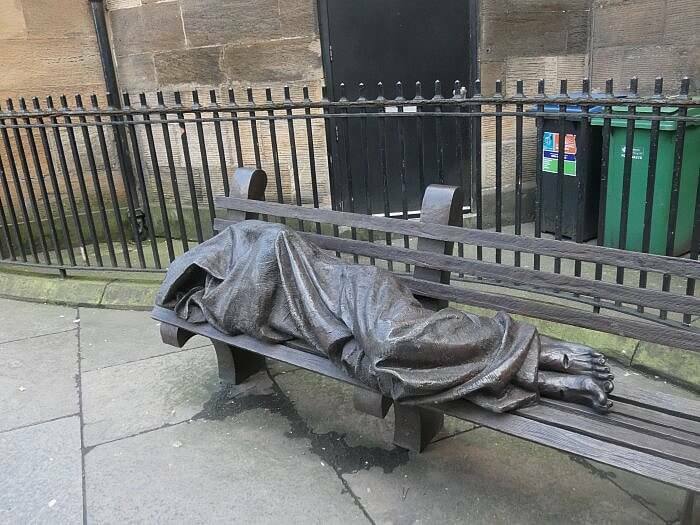 This statue of a rough sleeper huddles beneath a blanket on a bench behind the Tron Church just off the busy pedestrian area of Buchanan Street. Take a second look at the statue. You will notice the stigmata on the bare feet, and you will understand why this statue is also called homeless Jesus. The Duke of Wellington sits on his horse overlooking Queen Street from Royal Exchange Square. It is a classic military statue. Wellington, who is known for defeating Napoleon at Waterloo, is remembered with statues all across the UK. Glaswegians have put their own stamp on things. A stamp in the form an orange traffic cone. Though the duke sat quietly regarding the street for more than century — the statue was put in place in the mid 1840s — some time in the 1980s a traffic cone appeared as his headgear. City officials had it removed. It came back — and has kept doing so. 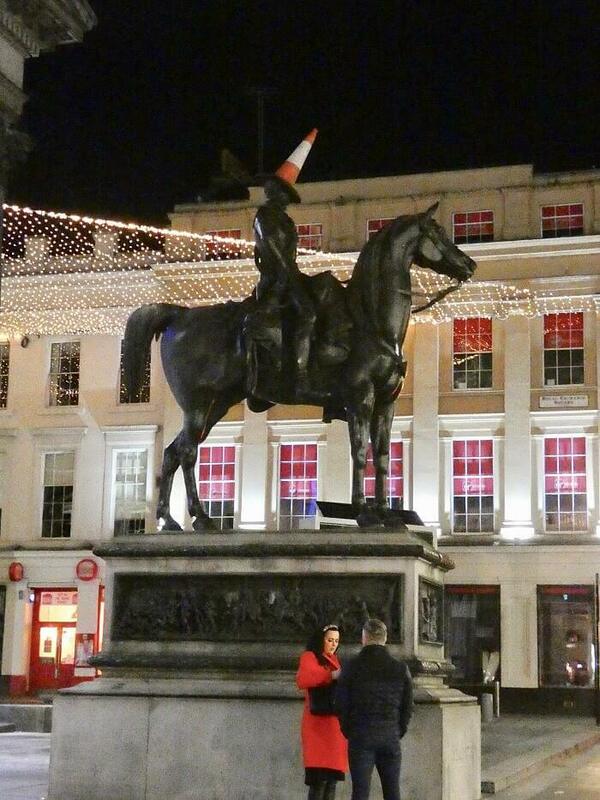 The duke and his traffic cone headgear have become a symbol of Glasgow’s wry sense of humour, and of creativity and resilience, too. At times his horse wears a traffic cone as well. 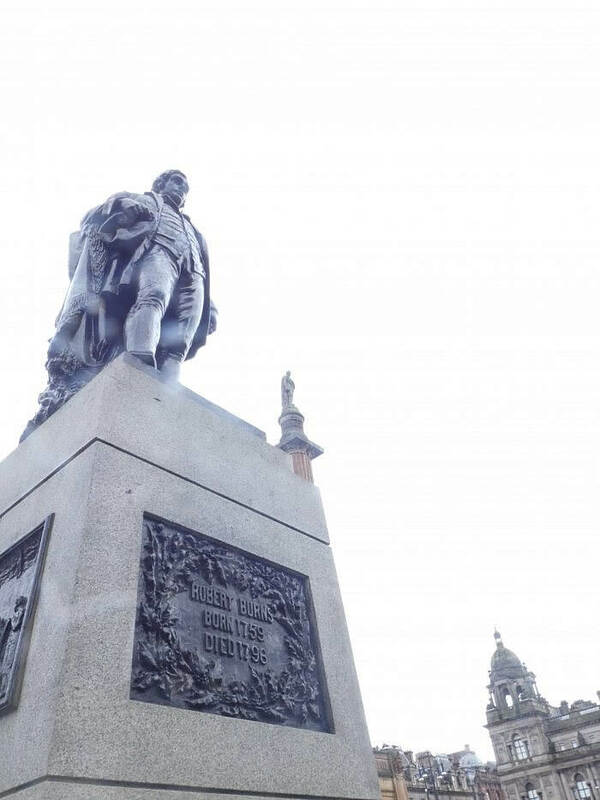 George Square in front of Glasgow’s City Hall is filled with statues of well known and lesser known folk. One you will want to seek out is that of Scotland’s national bard, Robert Burns. Music, poetry, creativity, history — all aspects of the life of Robert Burns, and of life in Glasgow, too. Next time you are in the city, take time to visit these statues and see how they help you understand Glasgow. The soldier at evening looks toward the University of Glasgow.